Happy BoyWilliam loves water, and so loves fountains very much. Starting the major assemblyWe continued outside on Wednesday afternoon. Cathy holds up "frame two" so it can be attached to "frame one" and the base. 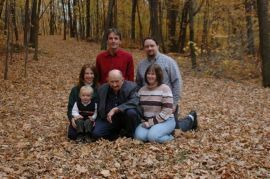 Before this whole project started, we had to do some semi-major leveling of the area, since it was on a gradual slope down toward our pond (most of our yard is sloping in some way). 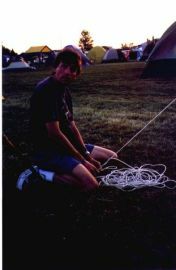 Know the RopesMan, our old digital camera really took some lousy pictures in strange lighting conditions. Wind CaveOne other attraction we went through was Wind Cave. Unfortunately due to the camera we brought into the cave acting up, we weren't able to get any pictures inside the cave. But we did get this one at the natural entrance. 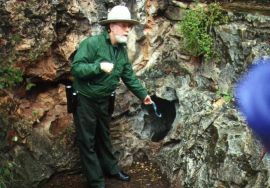 The ranger is demonstrating how the cave got its name -- wind sometimes blows out of the cave, and sometimes blows into the cave. 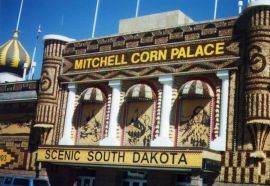 Mitchell Corn PalaceOn the long drive through South Dakota, it's nice to make an occasional stop. One nice place to make such a stop is the Mitchell Corn Palace. Every year the folks in Mitchell spend more than $100,000 to decorate this building with grains, and half-ears of corn. And every year, the designs are a different theme--they have a large gallery of pictures inside showing decades worth of previous designs. 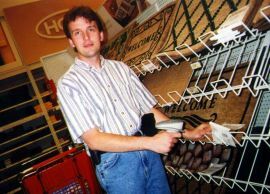 And you thought Iowans loved their corn! Cathy and DeereCathy poses by a very nicely restored old Deere.